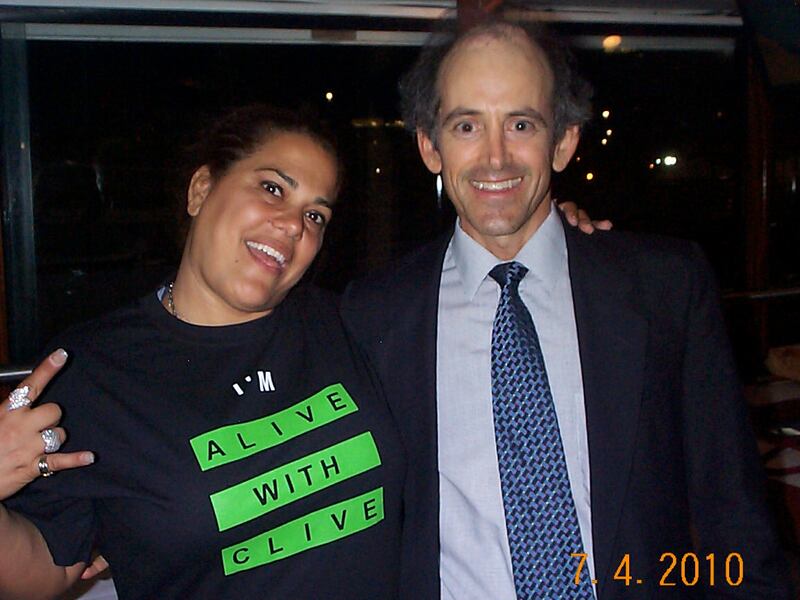 About three years ago, I created a special campaign to launch The “I’m Alive with Clive” T-shirt. 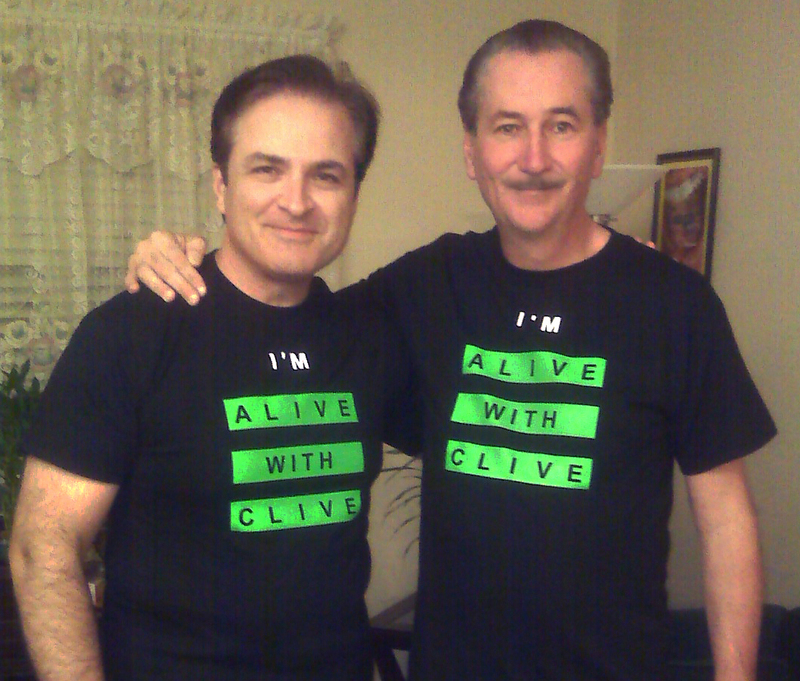 As part of the campaign, I placed a special page on my Web site to recognize and acknowledge the “I’m Alive with Clive” T-shirt Launchers. You can see who they are when you click here. In addition, I published a few Blog posts with pictures of “I’m Alive with Clive” T-shirt Launchers wearing their “I’m Alive with Clive” T-shirt. When you look at the Blog posts about these T-shirt launchers, while you do see them in their “I’m Alive with Clive” T-shirts, what you haven’t yet seen at all anywhere is yours truly, moi, in my own “I’m Alive with Clive” T-shirt. 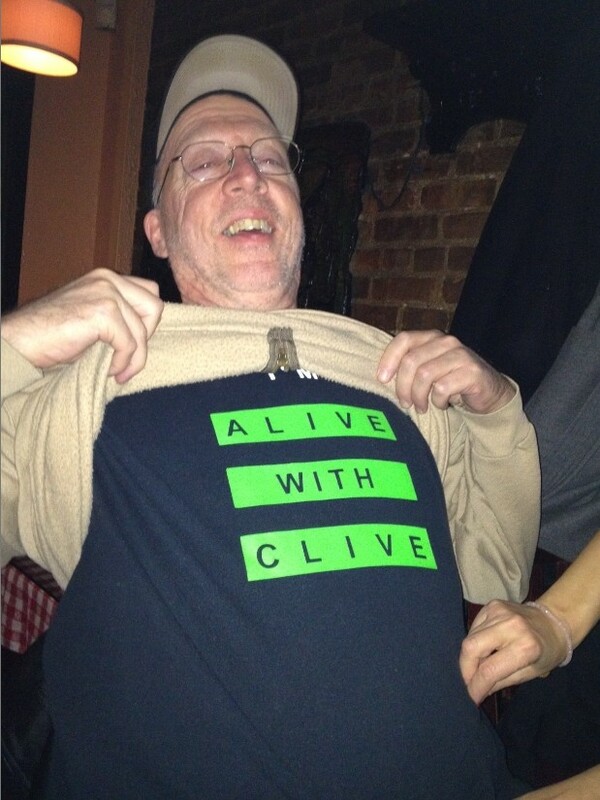 In other words, for almost three years after the launch of the “I’m Alive with Clive” T-shirt, I had not yet worn my own personal “I’m Alive with Clive” T-shirt. 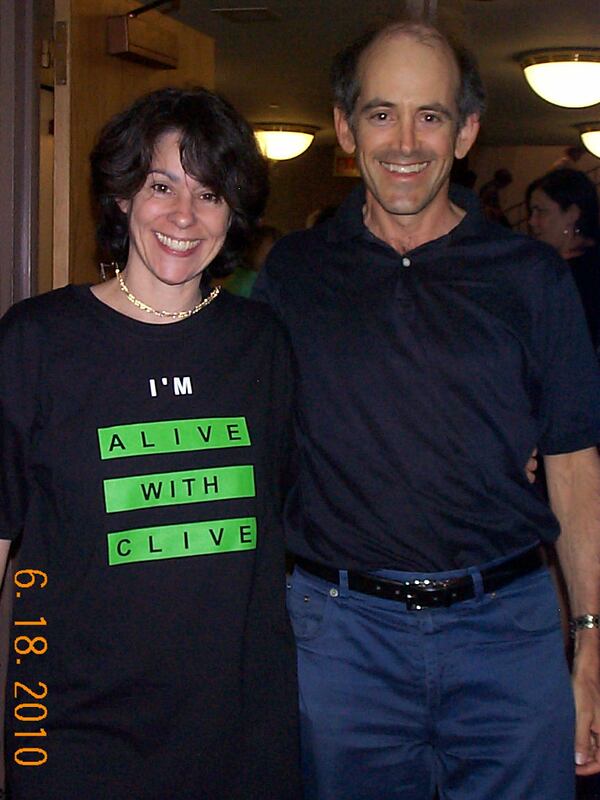 Or in terms familiar to Sir Richard Branson, my own “I’m Alive with Clive” T-shirt had not yet lost its virginity. After all those months of owning an “I’m Alive with Clive” T-shirt I had not yet worn, you can appreciate that I was (a) aching to wear it and (b) itching have a photograph taken of me in it. The question occupying my mind, though, was where would be the best place to have that first picture taken of me in my “I’m Alive with Clive” T-shirt? Next to The Statue of Liberty on Ellis Island? At the top of The Empire State Building? At The Eiffel Tower or outside The Louvre in Paris? In Red Square in Moscow? In St. Peter’s Square in Rome? Alongside The Great Wall of China? In front of The Sydney Opera House? At the foot of Mount Rushmore? With the Dalai Lama at Machu Picchu? With Sir Richard Branson at his villa on Necker Island? With Cassandra Kubinski at her Release Concert for her new CD, Just Being Myself? With Simon Cowell on the set of The X Factor? As you can tell, I gave this question considerable thought, and then eventually, after all those months of deliberation, the answer became clear to me. . . I apologize for leaving you with this real cliffhanger (pun intended, for reasons that will soon become apparent), but for a clue to find the answer to the question: Where did I lose my “I’m Alive with Clive” T-shirt’s virginity? be on the lookout for my next Blog post. This entry was posted in Alive with Clive and tagged "Just Being Myself", Alive with Clive, Alive with Clive T-shirt, Anton Evangelista, Cassandra Kubinski, cliffhanger, Dalai Lama, DJ Kamau Preston, Dop Dop, Dop Dop hair salon, Eiffel Tower, Ellis Island, Empire State Building, Global Community, Great Wall of China, Holly Yee, house concerts, I'm Alive with Clive T-shirt, I'm Alive with Clive T-shirt launchers, Jo Blackwell-Preston, John Galasso, Just Laugh, Just Laugh The Movie, Kamau Preston, Kylie Edmond, losing my virginity, losing virginity, Louvre, Machu Picchu, Moscow, Mount Rushmore, multiplying magnificence, necker island, Paris, Red Square, richard branson, Robert Randall, Rome, Simon Cowell, Sir Richard Branson, St. Peter's Square, Statue of Liberty, Sydney Opera House, The FIRST Alive with Clive Top 20, virginity, X Factor. Bookmark the permalink.